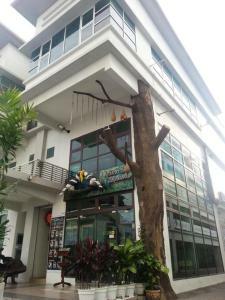 Hotels in Bayan Lepas (Malaysia). Just 5 km from the Penang International Airport, Eastin Hotel Penang is located next to Queensbay Mall. It offers a spa and modern rooms with free Wi-Fi. Rooms offer a flat-screen TV, minibar and private bathroom. A hairdryer and 24-hour room service are provided. Guests can enjoy a swim at the outdoor pool or exercise at Eastin Hotel Penang's fitness centre. Swez Brasserie at Eastin Hotel Penang offers international and local favourites, while the Lobby Lounge provides a variety of beverages, cakes and pastries. Eastin Hotel is located in Bayan Lepas, close to the Penang Bridge. Georgetown City, the heart of Penang, is a 10-minute drive away. Situated just a 5-minute drive from Penang International Airport, Express Hotel EST features a 24-hour front desk, complimentary Wi-Fi access and free private parking. The hotel is a 2-minute drive from Snake Temple. Queensbay Mall is a 15-minute drive away, while Georgetown City is a 25-minute drive away. Rooms are air-conditioned, and feature a flat-screen TV with satellite channels, ironing facilities and an en suite bathroom with shower facilities. Guests can get drinks from the vending machine, or request for the airport shuttle service, available at a small fee. Room service is provided. The hotel is located a 10-minute drive from Bukit Jambul Orchid and Hibiscus Farm. The War Museum is a 5-minute drive away, while the Snake Temple is a 6-minute drive from the hotel. The rooms at TH Penang Hotel are fully air conditioned and well equipped with a satellite TV, a writing desk and freshly laundered beddings. A hairdryer and ironing facilities are available on request. The cafe serves halal Malay food, as well as, Western dishes. Conveniently placed just a 15-minute drive from Penang International Airport, Apple 1 Hotel Superior provides clean and comfortable accommodation with free internet access and a 24-hour front desk. This affordable hotel is located just a 2-minute walk from the lively Queensbay Mall and a 10-minute drive to Snake Temple. The historical Georgetown City Centre is a 20-minute drive away and the popular Batu Ferringhi is a 45-minute drive away. Cooled with air conditioning, rooms at Apple 1 Hotel are tastefully furnished with a flat-screen TV with satellite channels and an en suite bathroom with hot-water showers. Hairdryer are available upon request. A 24-hour front desk will be happy to assist guests with luggage storage space. Set 150-metres above sea level, the luxurious Hotel Equatorial Penang features an 18-hole golf course, outdoor pool and 6 dining options. Spacious guestrooms offer modern décor and a private balcony. Rooms at Equatorial Penang come with hardwood furnishings and have plenty of natural light. Each well-appointed room is fitted with a minibar and TV with Internet Protocol Television (IPTV) facilities. Select rooms have a bathtub. Recreation facilities include squash and tennis courts. Guests can relax in the spa pool or enjoy a body massage. Day trips and sightseeing arrangements can also be made at the tour desk. Golden Phoenix Restaurant serves Szechuan and Cantonese dishes while Kampachi restaurant offers Japanese specialities. Penang Equatorial Hotel is a 5-minute drive from the Bayan Lepas Industrial Zone and a 10-minute drive from Penang International Airport. Vistana Penang Bukit Jambul enjoys a convenient location along Jalan Bukit Gambir, within 10 minutes' drive from Penang International Airport. The hotel offers free WiFi access in the entire property. The hotel is just a 5-minute drive to the first Penang Bridge, while Georgetown is a 30-minute drive away. It is a 35-minute drive to Seberang Perai and a 40-minute drive to Butterworth. Shuttle services are available to Queensbay and Bayan Lepas Free Industrial Zone, approximately 2 km away. Comfortably furnished, the spacious air-conditioned rooms feature warm lighting, satellite TV and a modern marble bathroom. Guests may utilise the fitness equipment at the gym, relax with a massage or simply lounge by the outdoor pool. Other services offered include laundry and a business centre. Meeting and banqueting facilities are also available. The hotel houses a restaurant serving a selection of Asian and Western dishes. A daily buffet breakfast is also available there. Set in the heart of Bayan Lepas, Krystal Penang’s suites feature dining and lounge areas and free internet access. It offers an outdoor pool and a fitness centre. 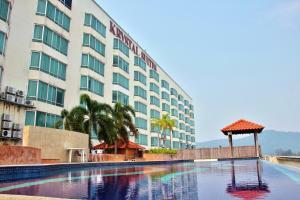 The Krystal Suites Penang is a 10-minute drive from Queensbay Mall and Penang International Airport. Spacious air-conditioned suites at The Krystal Suites Penang feature comfortable seating areas with cable TV and a sofa. They are fitted with a kitchenette and safe. Hairdryers and ironing facilities are provided on request. Regular workouts can be maintained at the large outdoor pool or well-equipped fitness room. Staff at the 24-hour front desk can provide laundry service. Those who drive enjoy free parking. Located in Bayan Lepas, 67 Residence offers homely and modern accommodation within a 2-minute drive from Bukit Jambul Golf Club. This self-catering property provides free parking space on site. Featuring a terrace/balcony, spacious house consists of 6 bedrooms, a separate living room, dining area and kitchenette. Amenities include air conditioning, wardrobes, a flat-screen TV and refrigerator. En suite bathroom comes with shower facility and free toiletries. At 67 Residence, guests are provided with daily housekeeping service. The friendly host is fluently-conversed in Malay, Chinese and English. The property is about 25 minutes’ drive from Georgetown, a UNESCO World Heritage Site. Queensbay Mall is 3.2 km away, while Penang International Airport is within a 4 km drive. Charmaine Lodge is an apartment with separate rooms for guests to choose. 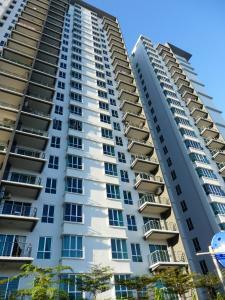 Located in Bayan Lepas, the property has a restaurant and outdoor pool. Guests also have access to a fitness centre. Charmaine Lodge is 1.4 km from the Snake Temple and 2.2 km from Queensbay Mall. Penang International Airport is 3 km away while Penang Bridge is 7.2 km from the property. Each air-conditioned room features a desk, clothes rack and fan. Guests have access to a shared bathroom and shared toilet. Operating a 24-hour front desk, the strictly smoke-free U Hotel Penang features stylish and contemporary accommodation with free WiFi access throughout the property. It offers free airport shuttle service during the day and complimentary parking on site. Tastefully furnished, air-conditioned rooms come with a desk, clothes rack, in-room safe and a flat-screen TV with satellite channels. Electric kettle and hairdryer are also included. The en suite bathroom has shower facility, towels and free toiletries. At U Hotel Penang, the friendly staff can assist guests with car rentals, laundry services and tour arrangements. Luggage storage facility is available, while fax/photocopying can be done at the business centre. 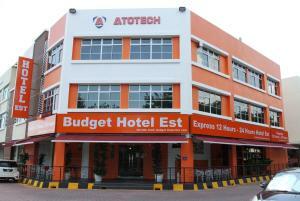 The hotel is 1.1 km from University Science Malaysia (USM) and 2.3 km from Queensbay Mall. Penang Bridge is 5.4 km away, while Penang International Airport is accessible with a 6 km drive. Offering pool/garden views from the balcony, air-conditioned villas come with a wardrobe, mosquito net, in-room safe and sofa seating area. A flat-screen satellite TV, DVD player, fridge and tea/coffee making facilities are also included. The en suite bathroom has a bathtub, shower facility, hairdryer and free bath amenities. Ironing facilities are available upon request. Other facilities offered at the property include fitness centre, barbeque amenities, meeting facilities and luggage storage. An array of activities can be enjoyed on site or in the surroundings, including cycling and hiking. The property offers free parking. The hotel is 9.3 km from Penang Bridge, 4.2 km from Queensbay Mall and 1.8 km from Snake Temple. UNESCO World Heritage Site of Georgetown is 30 minutes' drive away. Penang International Airport is about 3 km away, with free shuttle service provided. Strategically located in Bayan Lepas, Elit Natural Leisure Homestay Penang offers modern and comfy accommodation with free WiFi access in the entire property. It features an outdoor pool, fitness centre and free parking on site. The property is just 500 metres from the Snake Temple and 2.7 km from Queensbay Mall. Penang International Airport is 20 minutes’ drive away, while Georgetown is accessible within a 30-minute drive. Offering city, pool or sea views, air-conditioned apartments come with a dining area, a wardrobe, sofa seating area and a flat-screen TV. The kitchenette includes a fridge and electric kettle. En suite bathroom has shower facility and free toiletries. 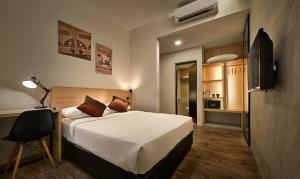 At Elit Natural Leisure Homestay Penang, guests can utilise the sauna facility or enjoy a game of table tennis on site. Friendly staff is fluently-conversed in Malay, Chinese and English. Barbecue facilities are also available.